Santa’s helpers? Christmas elves of the movie era are well-recognized as helpful little green-and-red-clad men with pointy ears who love to make toys—but the original elves were not quite so bubbly. In German, Scandinavian and Icelandic folklore, elves were thought to be creatures of the earth, living in rocky cliffs and hills. As the decorations of the season begin to be packaged up for another year, we offer you a selection of “real” elves. Darkness, illness, nightmares and strange incidents were often associated with elves in early German and Norse mythology. Clearly, those elves were not as good-natured as contemporary Christmas elves. People who were thought to be using witchcraft or magic were said to be involved with elven creatures. 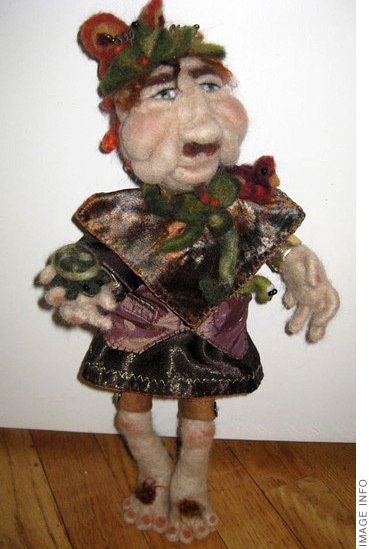 Some truer-to-folklore artistic elves: Etiana The Earth Spirit Fairy Doll (pictured above, left), created by Yeshe of StarCrystalKeeper. Made of polymer clay, this earthy elf holds a crystal in her left hand, presumably to use in one of the spells these creatures were known for. The handsome little elf poking out of his acorn tree on the right is the creation of Cindi Hardwicke of In the Shade of the Sycamore Tree. This Elfin Tree Vase is multi-purpose, made of stoneware clay and —we presume— a preferred environment for non-Christmas-related elves. The Hobbit: An Unexpected Journey (Warner Brothers / New Line Cinema, 2012) is the first film of the trilogy prequel to Lord of the Rings, and tells the tale of how Bilbo Baggins helps Gandalf and a group of Dwarves reclaim Lonely Mountain from the evil dragon Smaug. 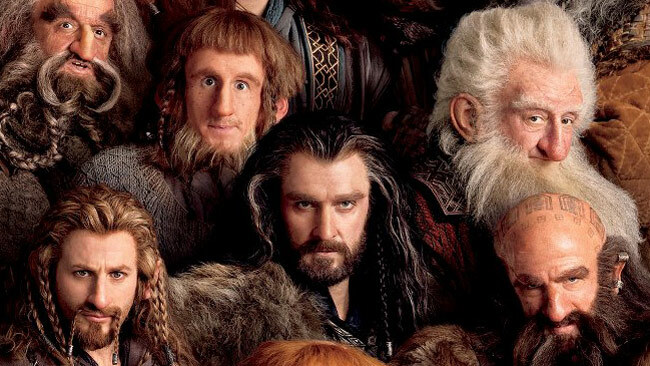 As might be expected, the film features a full cast of strange and wonderful creatures, any of whom would find a home here on FairyRoom: dwarves, goblins, trolls, dragons, and elves, including some old favorites from Lord of the Rings. Images and trailer courtesy New Line Cinema. My endearment for the horned beast only deepened as I discovered the abundance of vintage greeting cards portraying him cheerfully carrying bawling children to Hell in a barrel and spanking the bottoms of buxom women with fiendish delight. 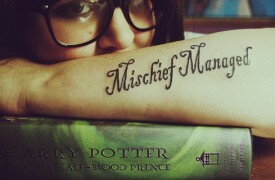 What was not to love? I soon discovered that this holiday gem had a long and colorful history, that there are winter festivals called Krampusnacht in many Alpine villages, where participants don wonderfully wicked handcrafted Krampus costumes then roam the streets rattling chains and bells and chasing random victims with sticks and switches. These runs, called Krampuslaufen, are fueled (not surprisingly) by alcohol; schnapps being the customary offering to the Krampus. I noted Krampus was often portrayed in the company of Saint Nicholas, the tall thin saint adorned in his bishop vestments, carrying his ornate ceremonial staff and looking stern. There was a lot that seemed not right here, at least by my North American perceptions of Christmas and Santa Claus traditions. 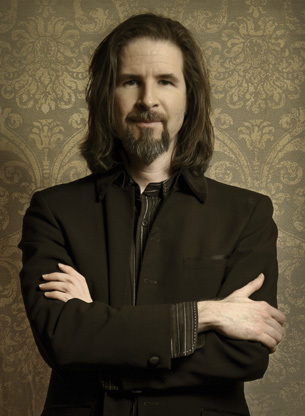 I had a litany of questions, but foremost in my mind was… hey, what does Santa Claus think of this guy? What exactly is their relationship? Call me crazy, but to me it seems a bit disingenuous for Santa to have an evil imp brutalizing and kidnapping children while he’s handing out gifts and shouting ho, ho, ho. Who came first? Whose idea it was to work together? Were they doing the good cop, bad cop thing, like God and the Devil? Was Krampus Santa’s slave? Were they pals, or mortal enemies? Which leads to the question most every schoolboy would ask—who would win in a fight? And it was these questions, especially the last, which inevitably led to the writing of this novel. Thus began my search for the origins of these two seemingly diametrically-opposed holiday figures. Working backwards from modern perceptions, through the vast variations of Santa and Krampus, I traced Yule traditions to their earliest pagan roots in the Winter Solstice. And for those who enjoy such, I would like to share my findings, but with the disclaimer that as with most ancient folklore, there are many versions, varying from country to country and even region to region. 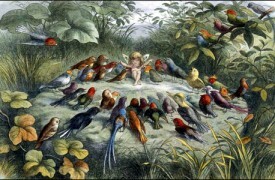 Here I have gathered the most common threads from which I wove together the mythos of this fable. Who came first? Santa Claus or Krampus? It could be argued that they both sprouted from the same origins, but variations of the Krampus far preceded any of the more humanized, charitable versions of Santa Claus. Winter Solstice and its associated celebrations date back long before the birth of Christ. Yule sprung from pagan winter festivals in Germanic regions, celebrating the rebirth of the land with feast and sacrifice, tying into Odin’s Wild Hunt and other Norse myths and legends. One of the prominent symbols of Yuletide is the Yule Goat, the Yule Goat which is one of the first manifestations of the Krampus we so dearly know and love today. 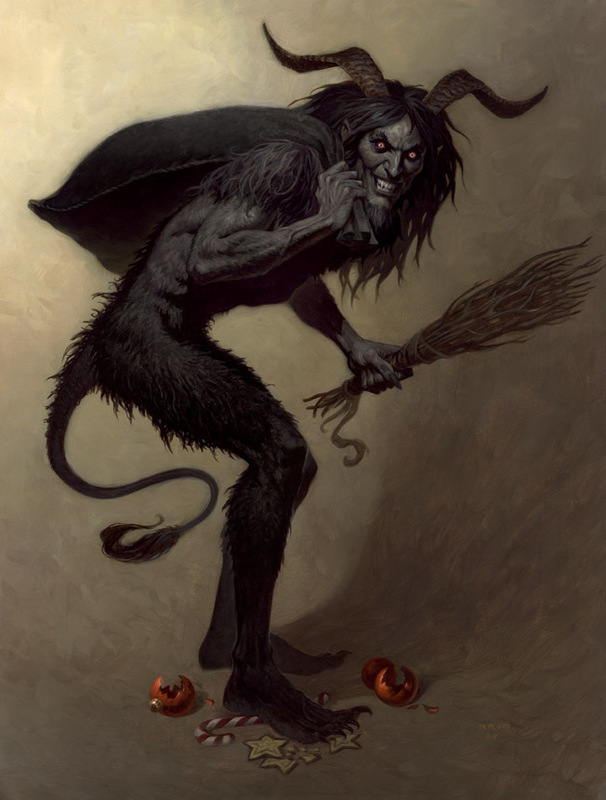 From the beginning, Krampus represented the change of seasons, a nature and fertility spirit who chased away wicked spirits and assured a bountiful growing season in return for tribute. Later he was assimilated into the evolving lore and legends of Germany and Austria. This lore spread into Croatia, Czech (Slovakia), Slovenia, Switzerland, and Northern Italy. The original Yule Goat was said to be an ugly creature that frightened children while making certain that Yuletide traditions were carried out properly. Later, the Yule Goat, or Krampus, was also attributed with handing out Yule gifts. In some legends Krampus has been associated with or said to be a version of the Norse god Loki, who is at times portrayed as a horned devilish trickster figure. These legends also suggest that Krampus carted children away to Hell, or Hel, to the daughter of Loki. These early manifestations had no association with Saint Nicholas. Once Christianity came along Krampus was cast, along with many other horned nature spirits, into the role of a demon or devil. 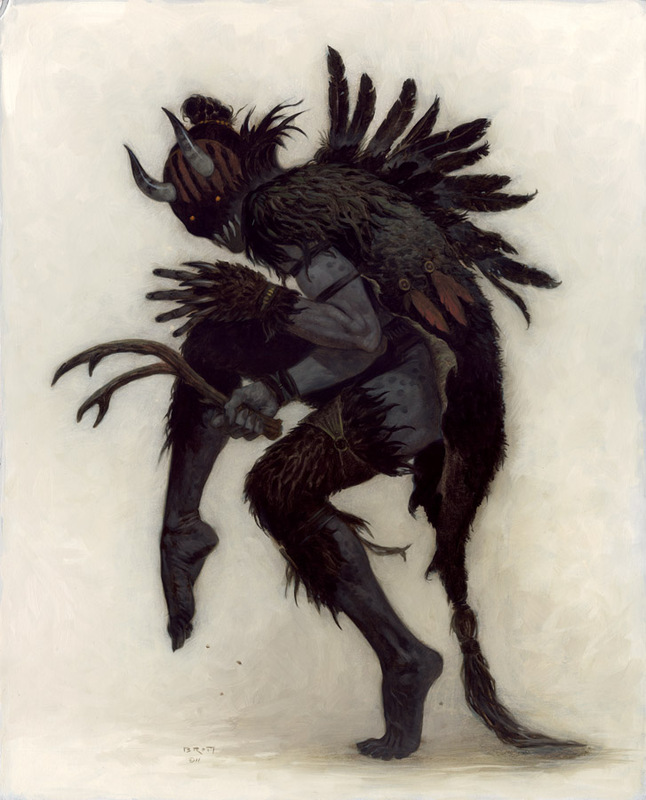 Despite several attempts over the centuries by the church and some European governments to stamp out Krampus celebrations, Krampus and Yuletide have endured and as with most pagan traditions, have been adopted (or as Krampus would argue, stolen) by and into their Christian counterparts, such as the bringing of evergreen trees and wreaths inside the home, and the leaving of gifts in socks or boots. 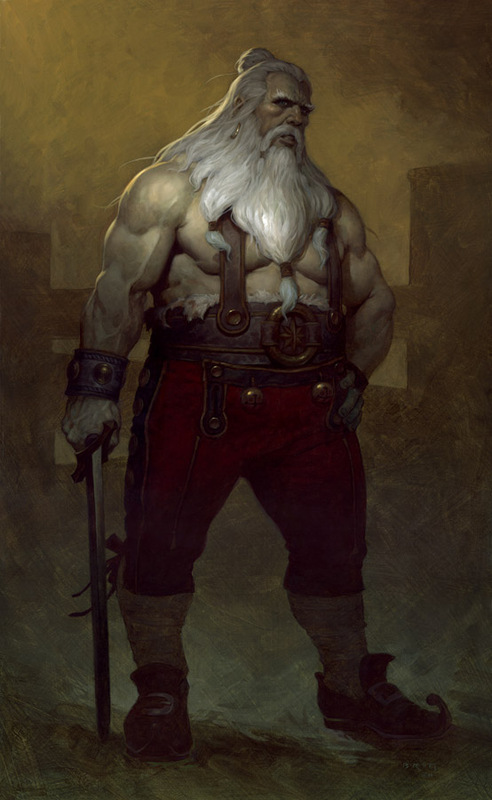 Santa Claus’s origins can be traced back to early Norse mythology and I seized upon historians’ associations of Santa Claus with the white-bearded Odin. But after digging deeper I felt Odin’s son, Baldr, made a closer comparison. It is written that Baldr was loving and gentle-natured, gracious, and fair to behold, that he spread charity and goodwill amongst the downtrodden—a Christ-like figure in many ways including his death and rebirth. His legend fit perfectly into my tale, from his tragic death by a mistletoe spear at the hands of his blind brother Hoor (guided by Loki), to his subsequent imprisonment in Hel and eventual rebirth after Ragnarok and the fall of Valhalla. As much of Europe transformed from paganism to Christianity, a few of their gods and spirits made the transition with them in one form or another, but most were left behind and forgotten. This adaptation to a changing religious landscape also fit perfectly into what I was trying to depict. Saint Nicholas as a Christmas figure is probably the first recognizable incarnation of our modern Santa Claus. Though the real Saint Nicholas died in 342, he was not recognized as a saint until the 800s, around the same time Christmas day was established. He gained widespread popularity in the 1200s as pagan practices began to wane and the Christmas holiday hit its stride in the late 1300s and 1400s. It was during this period that Krampus first became known as a Christmas devil and Saint Nicholas’s slave. In the 1500s the gift giving figure of Father Christmas rose in popularity, followed in the 1700s by the first mention of Santa Claus as St. A Claus. In 1809, the novelist Washington Irving wrote the Knickerbocker History, inventing the modern version of Santa Claus, followed shortly thereafter by Dr. Clement Moore’s famous poem, Twas the Night Before Christmas. The 1930s Coca Cola ads by Haddon Sundblom established the current well known cheerful, chubby faced Santa Claus in his bright (and conveniently Coca Cola red) crimson suit. Huginn and Muninn: Odin’s ravens. Geri and Freki: Odin’s wolves. Tanngrisnir and Tanngnost: The goats that pulled Thor’s chariot through the sky. 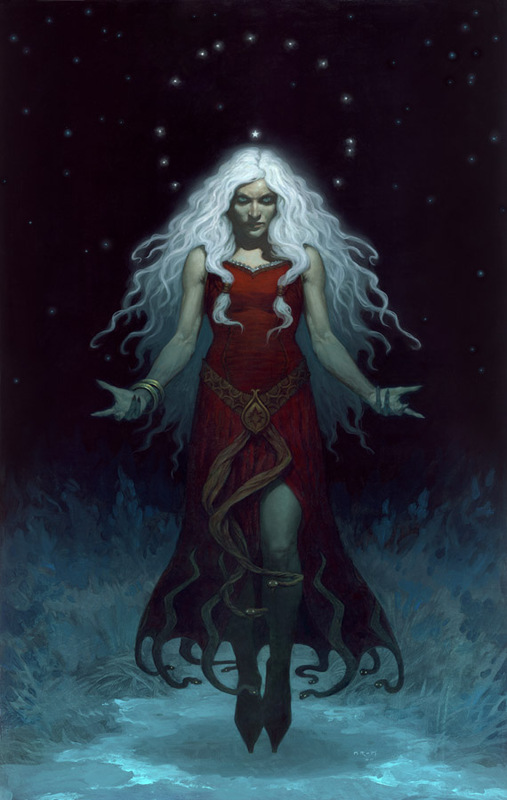 Hel: Both the name of the Norse netherworld and its queen, Hel (Loki’s daughter). Perchta: Female witch/spirit that roamed the midwinter countryside of Bavaria and Austria. Punished or rewarded children depending on their behavior over the year. Spain: The Netherlands tale goes that Saint Nicholas lives somewhere in Spain and arrives in Amsterdam each December by ship to hand out presents to good girls and boys. I can certainly understand why Santa would rather live in Spain than the North Pole. Belsnickels: Another of the many variations on Krampus, the Belsnickel tradition was brought over to America by early German immigrants. 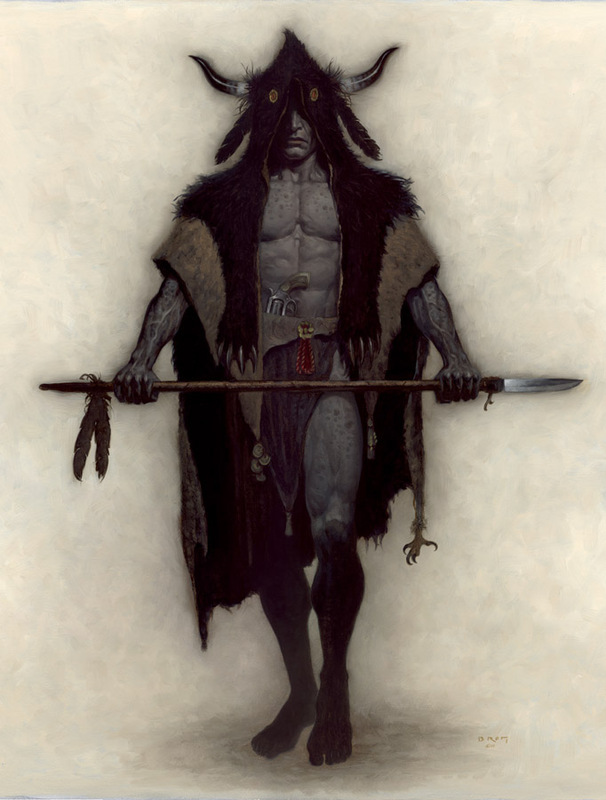 Some of the Belsnickels were known to wear masks and dress in shaggy bearskin coats or skunk skin caps. They often carried whips, or sticks, and sometimes even shotguns, handing out treats and doling out punishment to children as they saw befitting. Angels: In Belgium, Germany, Poland, Ukraine and Austria, angels often accompanied St. Nick on his Christmas runs. In the Czech and Slovak tradition, the angel is a protector for the children against the devil. Boone County, West Virginia: Though the township of Goodhope is fictional, many of the other locations are based on actual places in and about Boone County. Boone County captured my attention due to its long history of colorful characters, outlaws, and musicians, such as the dancing outlaw Jesco White and his notorious family, singer songwriter Billy Edd Wheeler, as well as the local legendary one man band, Hasil Adkins. In 2005 Hasil was deliberately run over in his front yard by a teenager on an ATV and later died from his injuries. Areas in Boone County, like so many other rural communities, are suffering from the tragic effects of the growing meth epidemic. Strip mining is also taking a devastating toll on both the community and the land. It has been a delight spending time with Krampus. I feel a much closer kinship with him than his jolly counterpart. It is my hope that Krampus will continue to catch on around the globe and reclaim his rightful place as Yule Lord. If you share this sentiment, then be sure to leave out a few treats in your shoes this coming Yuletide and who knows, you just might find a gold coin or two. If you don’t… well, you’ve been warned—Krampus is coming to town. 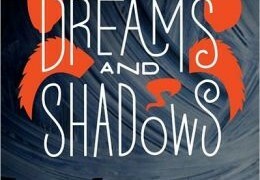 All images © 2012 Brom courtesy of Harper Collins. 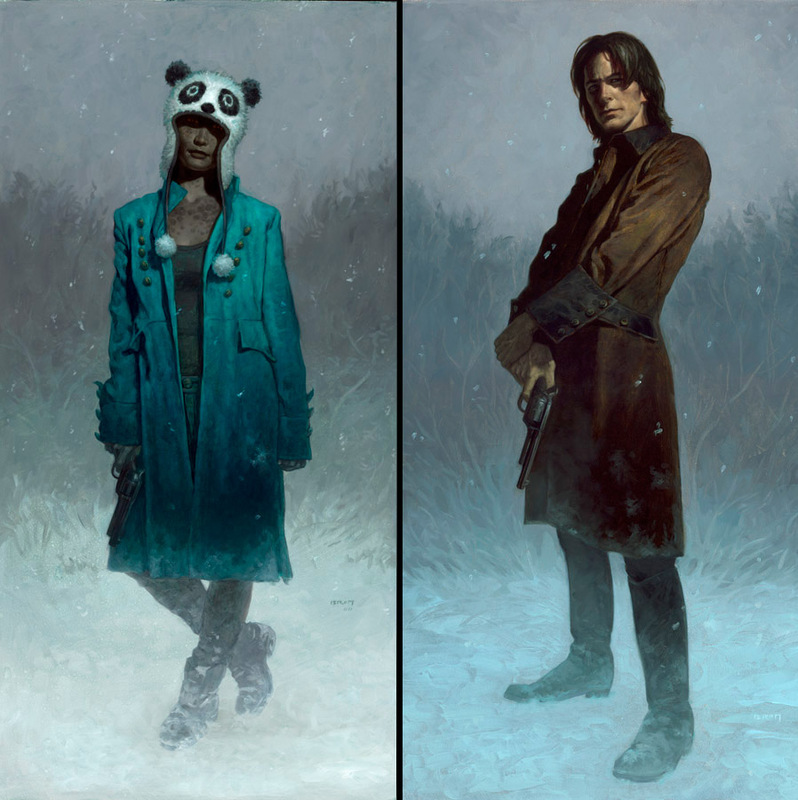 Brom has lent his distinctive vision to all facets of the creative industries, from novels and games, to comics and film. 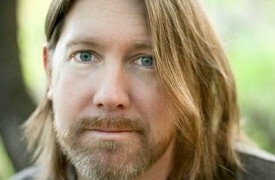 Most recently he’s created a series of award winning horror novels that he both writes and illustrates: The Plucker, an adult children’s book, The Devil’s Rose, a modern western set in Hell, The Child Thief, a gritty, nightmarish retelling of the Peter Pan myth, and his latest concoction, Krampus, the Yule Lord, a tale of revenge between Krampus and Santa set in rural West Virginia. Brom is currently kept in a dank cellar somewhere in the drizzly Northwest. There he subsists on poison spiders, centipedes, and bad kung-fu flicks. When not eating bugs, he is ever writing, painting, and trying to reach a happy sing-a-long with the many demons dancing about in his head. Find out more at BromArt.com. 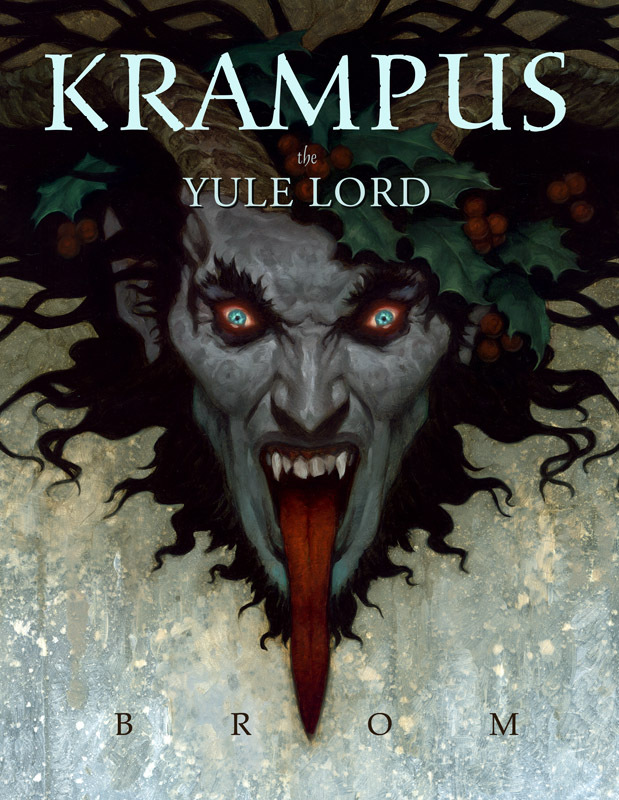 Enjoy an excerpt of Krampus: the Yule Lord on Tor.com.